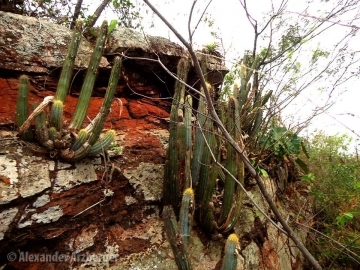 Growing habit at Cerro Corá, Paraguay. 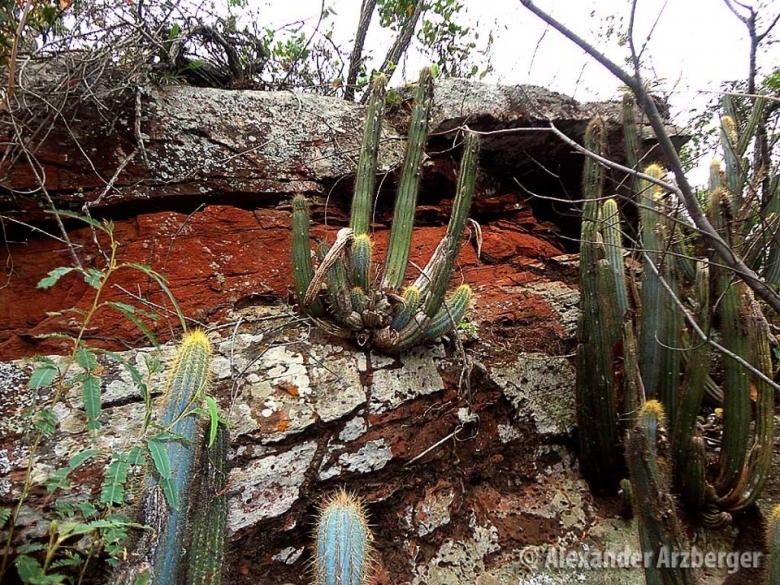 Origin and Habitat: Brazil and Uruguay (Southern America). 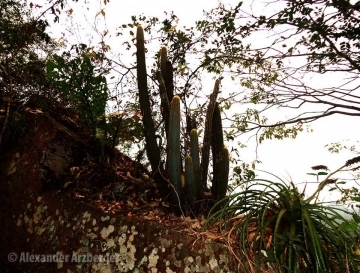 Description: Pilocereus juaruensis is a columnar cactus 1-1.5 m tall, branching from the bottom. It is distinguished for the branches that are blue-green, shining glaucous blue when young with yellow fine needle like spines. 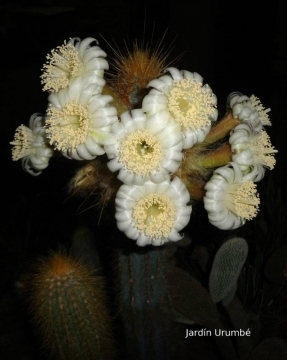 Remarks: Pilocereus paraguayensis, described by F. Ritter in 1979, assuming it was a different species, is not sufficiently differentiated and is considered merely a local variant of Pilocereus juaruensis (from the nearby Brazil) which was described earlier by Buining & Bredero, in 1978 as Pseudopilocereus juaruensis Buining & Bredero. F. Ritter probably did not study the Brazilian populations, but they are the same, with only small local differences. The rule in the taxonomy is that the oldest name has priority, and the newest is the synonym. Stems: Blue-green 5-8 cm thick. Ribs: 10-12, with dull, hardly notched 10-14 mm high. Areoles: Round,2-3 mm in diameter, 4-7 mm apart with brownish or greyish felt and a bunch of white woolly hairs at the bottom areole. Spines. All fine acicular, straight, flexible, pale yellow to brown yellow from base to tip. Radial spines ca 12, spreading sideways to the areoles, 3-10 mm long. Central spines 3-5, hardly more, 7-40 mm long. 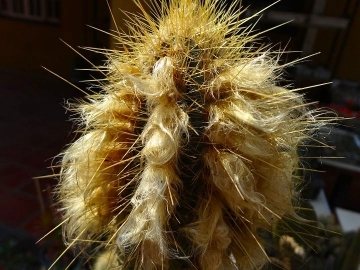 Pseudo-cephalium: The area where the flowers will grow is called a pseudo-cephalium, it is usually well defined, apical to lateral, involving several ribs covered with dense, 1.5-3 cm long tufts of dull but brighter woollen bristles. 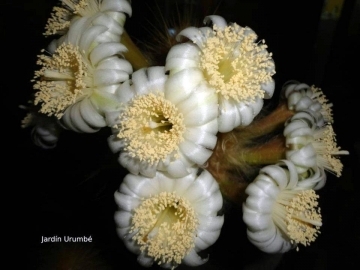 Flowers: Nocturnal, slightly fragrant, 8 cm long and 5 cm wide. 3 mm long, 5 mm wide, with white flesh and dried remnants of its flower. Seed: Black 1.5 mm long, 1.0 mm wide, 0.7 mm thick. 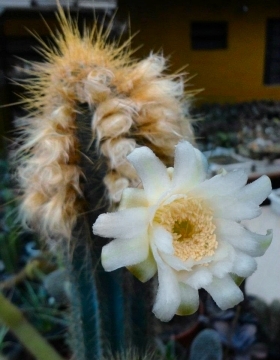 1) Pilosocereus paraguayensis F.Ritter in: Kakteen Südamerika 1: 249. 1979. 1: 249 1979. 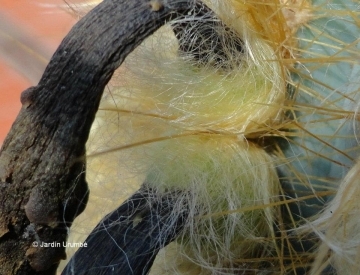 2) Pilosocereus juaruensis ( Buining & Brederoo ) P.J.Braun in: Kakteen And. Sukk. 35(8): 181 (1984). 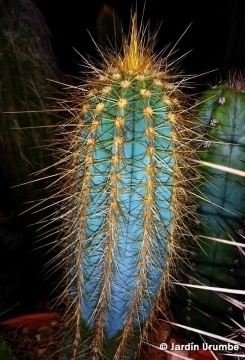 Cultivation and Propagation: Pilosocereus juaruensis grows well and is a very vigorous growers , and is possible to increase the speed of growth to some extent by providing adequate amount of water, warmth, and an all-purpose liquid fertilizer diluted half strength during the active growing season, but it’s susceptible to rotting if too wet. It likes a sunny position also blasting sun in summer. If grown indoor provide 4 to 6 hours, or more, direct morning or afternoon sun. It should be watered regularly in Summer and kept drier in Winter. It like pots with generous drain holes, need a very porous, slightly acidic potting medium (add pumice, vulcanite, and perlite). It can be grown outdoors in frost-free climates, needs anyway to kept above 12 °C and dry in winter. But it can tolerate temperatures down to 5° C (or even 0° C) for very short periods if very dry and ventilated.